However, I did manage to make 6 napkins before Thanksgiving was upon me and I realized that there was no way, José, that they were going to be completed. So, I put them away for later. "Later" became July 2015 and I am in the process of finishing them up. The EPP tutorial comes from Mollie Johanson of Wild Olive. 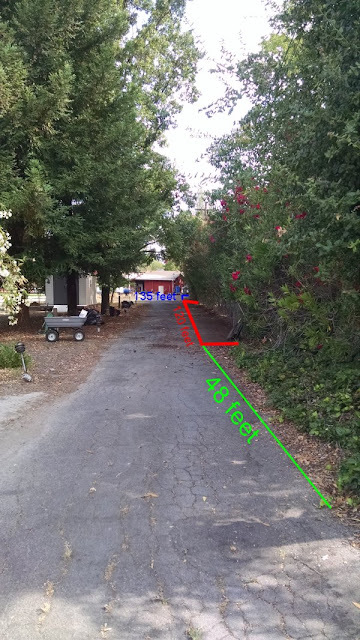 Her tutorial is excellent: easy to follow instructions that are thorough. A template for the hexagons is also included, if you don't have any of your own. Mollie's tutorial calls for making the turkey "feathers" from 2 half-hexagons, which are then stitched together. That's easy enough but *I* am terminally lazy. 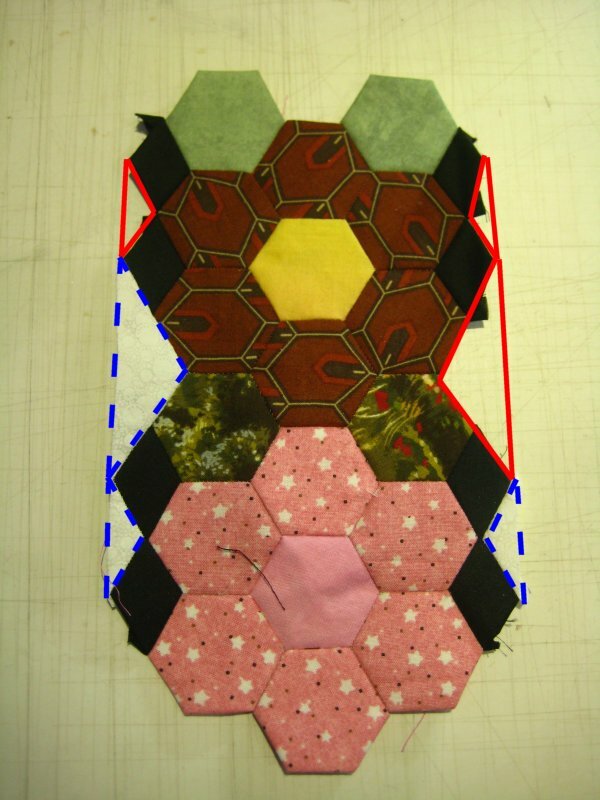 I got the same visual effect by simply sewing two pieces of fabric together into a "mini strip set" and cutting my hexagon fabric from the stitched together fabric, making sure to orient the seamline of the fabrics as Mollie shows. 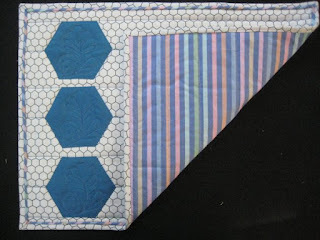 In this manner, I didn't need to fuss with a lot of small half-hexagons and I didn't need to sew them together! 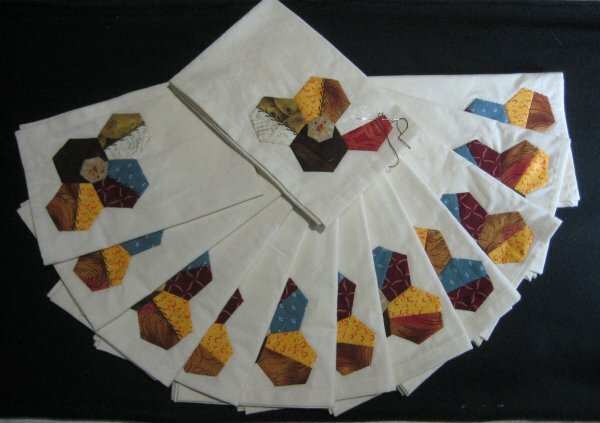 Once the turkeys were stitched together, I appliqued them diagonally to the corner of a napkin. Oh, the napkins. Originally, I bought some coarse, rustic commercial napkins. I liked the rough, textural look of them. BUT ... they were cheap. And *no where* near square. Good Lord, when I folded them up, they were horridly askew. There was no way I could ever use them. Good thing they were inexpensive. On the other than, I certainly got what I paid for. Because I know how to make a mitered hem, I decided I would make my own napkins .... they aren't that difficult at all. I like mitered corners because they are FLAT. It's a MUCH better and elegant look than simply folding the hem back on itself .. that results in an ugly lump in the corner. ICK. I cut approximately an 18" square, made my mitered corners and machine stitched the hem. Sure, it took a little more time but I'm pleased with the napkins and they didn't cost anywhere near what good quality commercial napkins would. When both leaves are inserted into my dining room table, I can fit 12 chairs around it .. so I made 12 napkins. Although I haven't done so yet, I may still make a table runner to coordinate with the napkins. 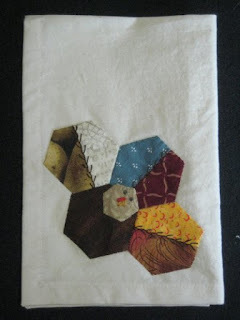 The tutorial instructs you to do a contrast running stitch around the perimeter of the turkey on the dish towels. I didn't want to have that stitching show on the back of my napkins so I chose to not to do it. But, to dress up my turkeys just a bit, I chose instead to do a feather stitch down the seamlines of the hexagon "feathers" surrounding the turkey. 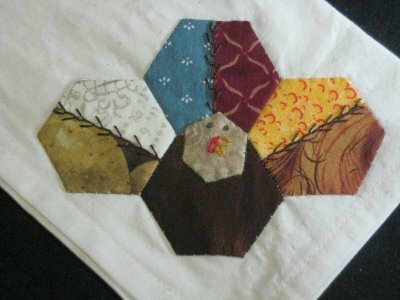 I slid the needle between the turkey hexagons and the napkin fabric so the feather stitch never shows on the backside of the napkins. The only evidence that something was done is the tiny, tiny knot at the bottom of the feather stitching. I started my hexie journey in the summer of 2013. I remember it distinctly because hexies were HUGE at that time. 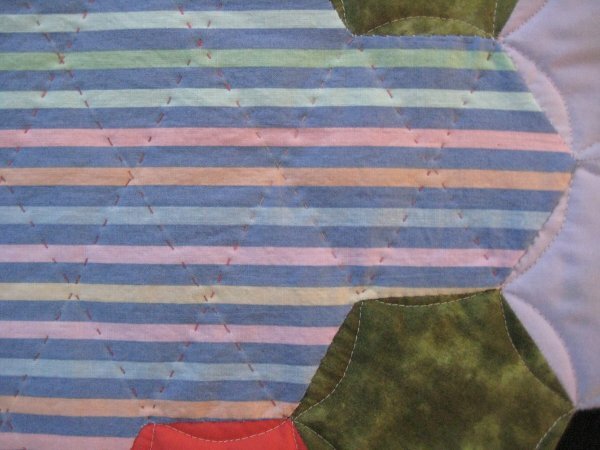 I wasn't sure if I wanted to join in the frenzy so during our annual family camping vacation, I decided that my handwork project that year would be to make some hexagons with the English Paper Piecing method of construction ... just to see if I even LIKED the process. 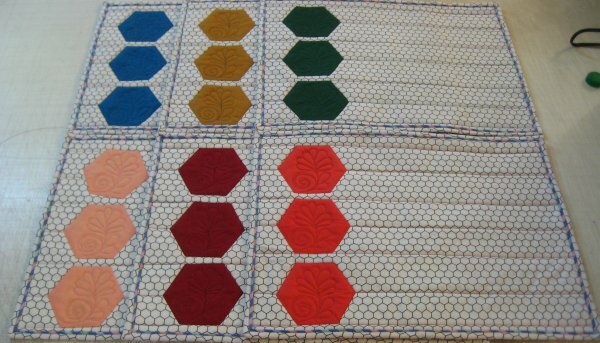 I intentionally made these preliminary hexies big ... 2.25" along a side ... because as long as I was making them, I wanted to make something WITH them .. and I wanted the hexies to be of sufficient size to be able to do that. I got a multi-sized hexagonal template, cut a bunch of paper templates, cut my fabric and started the process. 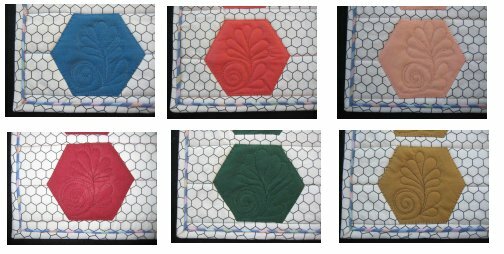 I used solid fabric for these hexies. Since this was an experiment, I didn't want to "waste" good fabric, ya know? During the preparation process, I tried all different techniques. I am self-taught, and I scoured the internet for any instruction pertaining to hexagons. There is a LOT of information out there. The preparation technique that ended up working the best for me was to thread baste the corners together but NOT going through the paper template. 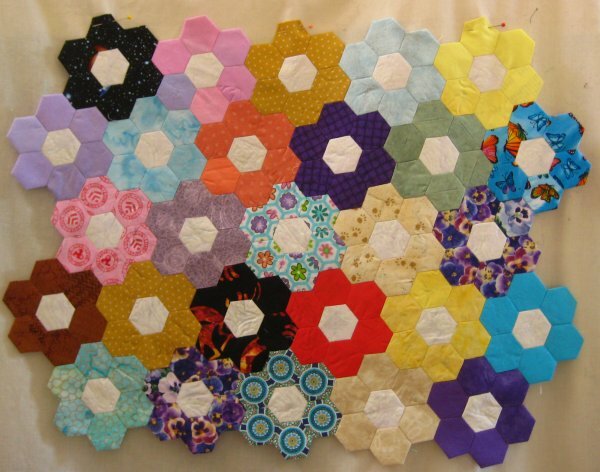 It turned out that once I found that process, I *LOVED* *LOVED* *LOVED* making hexies. There was a Zen-like calm in my mind and I churned out the hexies like nobody's business. It was the absolute *perfect* portable handwork project for me when I was away from home. Because I was just experimenting at this point, I really didn't plan for any color placement and had simply cut a bunch of squares without regard to the final project. Once I had used up all the solid fabric that I had pre-cut for our vacation, and not having any access to more, I put them together into a table runner for our dining room. I used an interesting finishing technique that is essentially a faced backing. 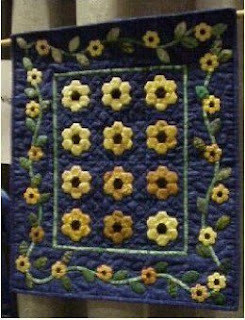 This technique is a tutorial by Amy Gunson. 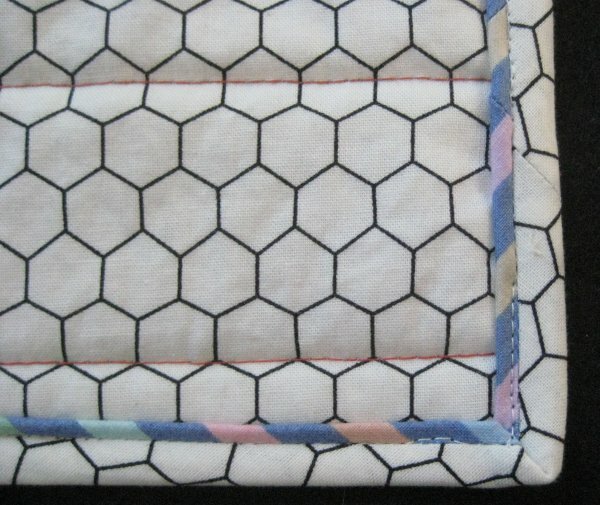 I made a "ring" of hexies in the same shape as the perimeter of my table runner and stitched/appliqued this ring over the top of the backing fabric. Oh and the backing fabric! Since this was "just an experiment", I used some truly awful plaid fabric for the backing. After all, who looks at the back? And, it allowed me to finish the table runner. 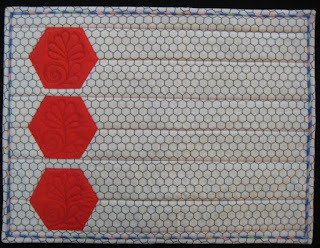 I machine quilted it with continuous curves. So, let's fast forward to the Summer of 2015 .. that's now. :-) Once again, I am trying to work through the UFOs that I have piled up. The UFO that I chose to kick-start this effort was a Lone Star. I worked as much as I could on it until I was stalled by lack of specific fabric. So, while I waited for the specific fabric to arrive in the mail, I decided to work on smaller scaled projects, just so I could get them finished. That way, they would stop *nagging* me. 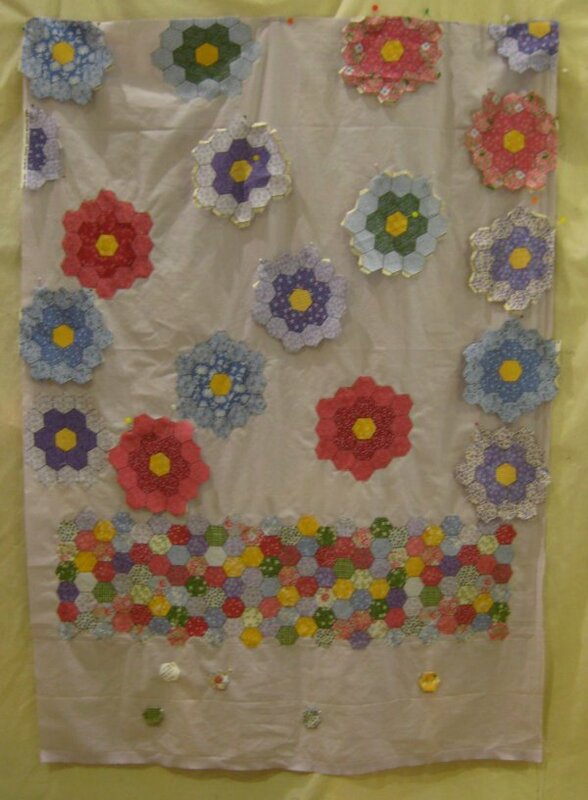 The interim project that I chose was that table runner of 2013. 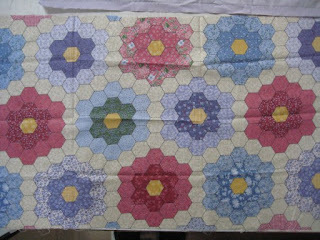 Yes, the table runner was finished, but what the heck was I going to do with just a table runner? It looked rather lonely all by itself on the table. Soooooo ... to keep the table runner company, some placemats were in order. But, I didn't want another long, drawn-out project on my hands because I'm anticipating the arrival of my Lone Star fabric. 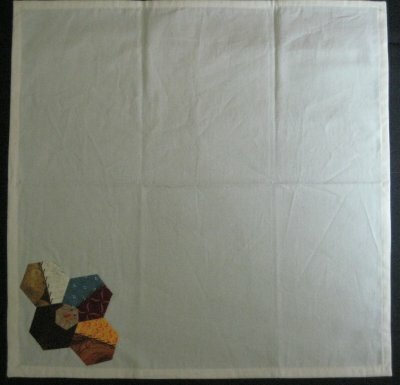 Once that arrives, I want to return to *that* project and *not* have the placemat project hanging over my head. With that restriction in mind, the placemat layout that I devised was VERY simple. 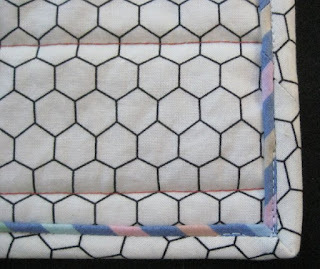 The rectangular placemat would be made of a single foundation fabric, which looks like either hexagonal bathroom floor tiles or chicken wire .. depending on your poin of view. There would be a column of detached hexagons down the left hand side. 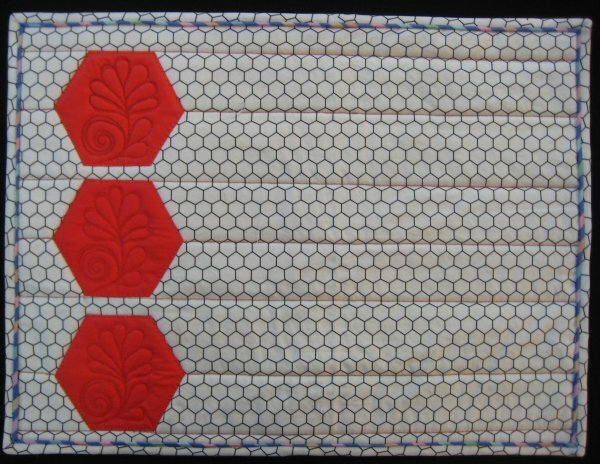 SIMPLE simple machine quilting and a faux piping binding for just a splash of color. That is *exactly* what I did! Without any extension leaves, my dining room table will seat 6 people. Hence, 6 placemats were made. Each placemat had a different color of hexagons in its column. 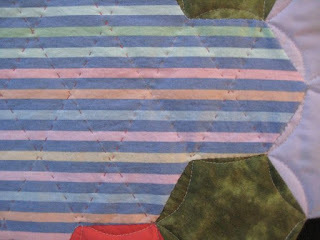 Although it's difficult to see, I used thread that matched (or closely matched) the hexagons for the quilting. 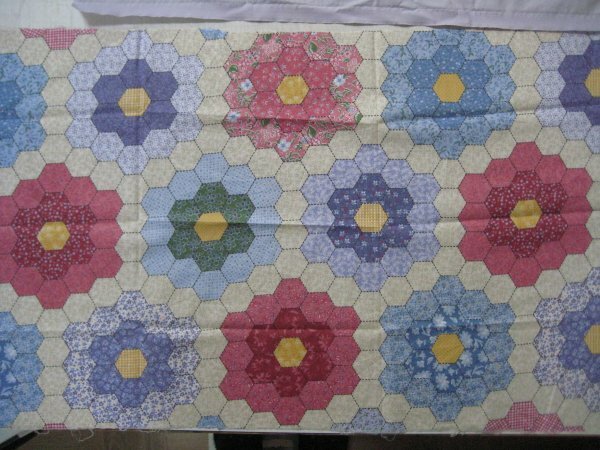 I stitched several horizontal lines to stabilize the placemat and a stylized flower inside each hexagon for interest. Another requirement of mine was that I wanted to use only stash fabric for the placemats. I didn't want to buy anything else. I had the chicken wire fabric .. that was perfect for the front of the placemat. But the backing? Well .. hmmm ... what could I use? This is the first time that I have used this faux piping technique. I used the tutorial by Lissa Alexander titled "Faux Flat Piping". It works perfectly! Her proportions of the binding to piping fabric result in just the tiniest roll of piping and is SO EASY to do. The finished effect is awesome. 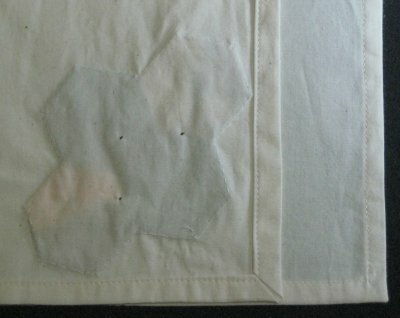 The binding is actually made of 2 fabrics: the "binding" and the "piping". What I really like about this binding is that since I used the same fabric for the *binding* part, it looks as though the "piping" is floating. I cut the striped fabric for the piping on the bias because it results in a delightful diagonally striped strip for the piping. I really do just love diagonally striped binding (or piping, in this case). It presents such a dynamic statement.